Now offering $1.00 refills on all small and medium sizes of pop and popcorn! We've also added Sobe beverages and Frappuccino! We serve a wide variety of Pepsi products. We also carry your favorite beverages in 20oz plastic bottles including Aquafina, Sobe Lifewater, Hawaiian Punch, Gatorade, and Lipton Teas. Bottle selections may vary. We also have the best Icees around! Enjoy a yummy Icee treat in grape, cherry or blue raspberry! All large beverage purchases receive free refills on same visit. $1.00 refills are available on all small and medium sizes! Our concession snack menu includes delicious popcorn, made fresh all day long, with complementary Kernel Season's® Gourmet toppings available in several of your favorite flavors. 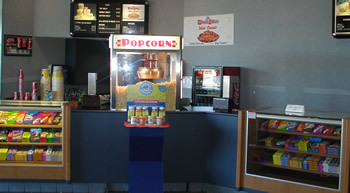 All large popcorn purchases receive free refills on same visit. $1.00 refills are available on small and medium sizes! We offer a HUGE selection of all of your favorite candy treats available in a variety of price ranges. We also serve warm nachos and a Kids Combo that comes with pop, popcorn and candy. We gladly accept cash, Visa & Mastercard and Lake 5 Gift Certificates at our concession area.